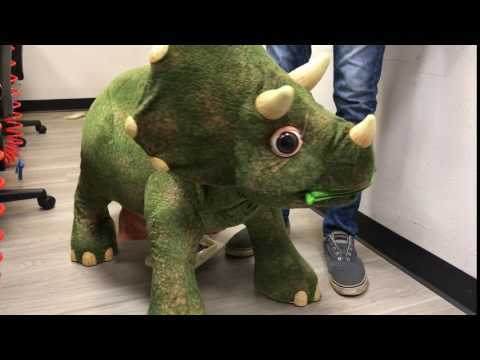 The UBIF training team got an unexpected challenge this week when a corporate employee brought in her child’s broken Triceratops toy. It had been a lucky thrift store find at $90 for a toy that is normally around $500. It worked when she first brought it home, but the original batteries were still in the terminal and had rusted over and corroded. The batteries were making contact and as soon as she tried to change them, the toy stopped working. She brought it to the training team for some assistance and what could’ve been seen as a lost cause actually turned out to be an extremely simple fix. The team removed the corroded and rusty battery terminals and installed new ones. They had to shave and reshape the plastic housing for the battery terminals because the new size batteries terminals would not fit right. Then they installed new wiring to the motor, rewiring the two leads for the positive and negative feed. Luckily, the motor and the plastic bits on the inside were all intact and in working condition. The problem stemmed from the original batteries sitting inside the terminals for far too long and corroding. 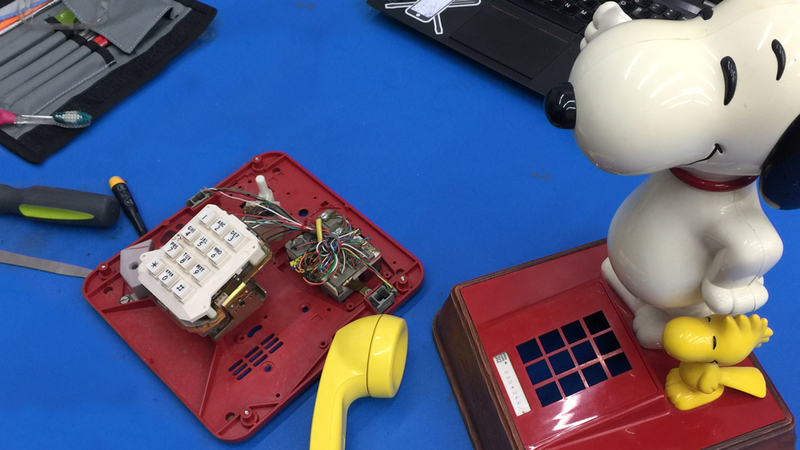 The whole repair cost the team around $6 for the new terminals and wires. They had to cut open the fabric around the power source, but they were able to stitch it back together nicely. While this little dino will certainly make the list of the most interesting things we have repaired, it just goes to show that we are willing to tackle anything with a power button. Does this include PIXEL XL? Hi Chad, If you reach out to our customer support team at 877-320-2237, they can help you out. What do I need to get my pixel XL screen fix? Hi Wisam, If you reach out to our customer support team at 877-320-2237, they’ll tell you which location is closest to you! Hi Mia, I have the same problem in South Florida. We damaged the pixel on our Ipad 2 after our power went out and we were using our ipad for News & Information. Tammy, sorry to hear about your device! The offer does extend to Hurricane Irma victims in Florida. We can only offer free repairs on the Google Pixel but we would still happily take a look at your device and offer the lowest price possible for the repair. Is Florida included in that free repairs?? My phone fell and the th lass brook while we were evacuating. Hi Teresa. Yes, Florida is included, but only for the Pixel, phone by Google. 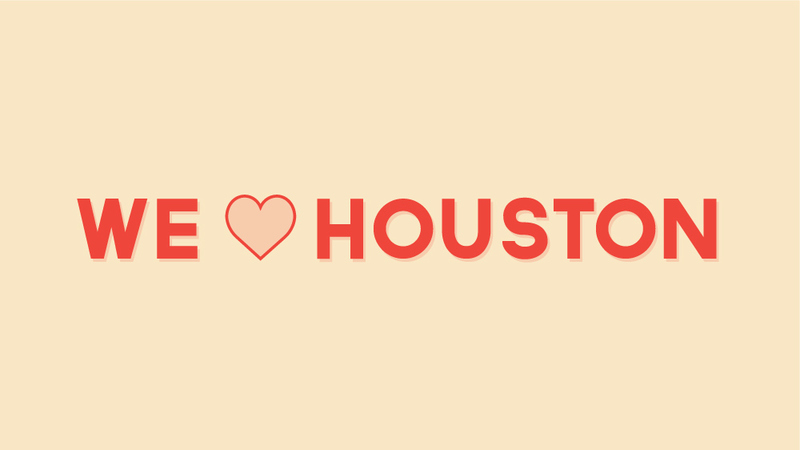 This is such an awesome thing you are doing for Houston & the Pixel devices, but what about Samsung Galaxy S8+ & Hurricane Irma in Florida? Especially since you are now authorized service providers for Samsung!!! Lamonica, the offer does extend to Hurricane Irma victims in Florida. We can only offer free repairs on the Pixel because Google generously offered to cover the cost of their parts, but Google can only provide the parts for their own phones. We would still happily take a look at your device and offer the lowest price possible for the repair. I actually contacted my local UBREAKIFIX in Brandon, FL & was happy to hear that they had the lowest repair prices in the area. Thankfully they had a display in stock & was able to replace my screen in under an hour this past Monday (9/18). I am so pleased with the quality of work that was done & the time it took that I have already recommended them.